From: The Saturday Paper, Mar 8, 2014 “The ABC of Mark Scott”. The boss of the public broadcaster on budgets, barons and the ‘winner takes all’ attitude in today’s media. ‘‘The A is for Australian, and Australians understand that,’’ Mark Scott says of the ABC. Mark Scott is in shirtsleeves, sitting back in his chair, his long legs stretched out, his hands clasped behind his head. At the meeting table in his office on the 14th floor of the ABC’s Ultimo headquarters, he takes in the view over Sydney rooftops, but his mind’s eye has a wider focus. These are revolutionary times, when those who see themselves as his competitors – commercial television stations, print newspapers, digital portals – are desperate for audiences and advertising dollars. An editorial in The Australian said he was “an executive out of his depth”. The prime minister expressed frustration with the ABC for taking “everyone’s side but Australia’s”. I begin by proposing that this is among the hardest times ever to be the managing director of the ABC. [MS] I think so. When I started here the coexistence of commercial and public [media] had settled in quite happily … and it worked. Now the intensities around the battle for digital have meant competition for audiences and competition for revenues. I’d say the ABC has had minimal impact on this – we’re taking no advertising revenue, we’re taking no subscriptions – but there does seem to be a battle for the ages that’s going on now and it does feel a bit “winner takes all”. [RK] It must make navigating a path through this hard for you? [MS] I admit we’re in a fortunate position. We’re given a lot of money from the government but we do a lot with it. The things we’ve done in recent years have been embraced by the public. [RK] Speaking of the media barons still holding onto their ideas of themselves and their influence, you said in your A.N. Smith lecture: “Today they seem largely out of solutions – and instead challenge reality by seeking to deny a revolution that’s already taken place, by attempting to use a power that no longer exists, by trying to impose on the world a law that is impossible to enforce.” But when the barons have the ear of government, does the impossibility of your opponents enforcing their power still apply? [RK] What are they doing with their power? [MS] A paper like The Australian cuts through by developing an agenda and delivering it within an ideological frame. You’re seeing the use of editorial power for a purpose rather than simply journalism in its own right. [RK] Are you being blamed for taking audiences from them that they feel they are entitled to? In the same year as your lecture, 2009, James Murdoch was criticising the BBC, saying free access to their online sites made it incredibly difficult for private news organisations to ask people to pay for their news. [MS] The Murdochs will look after their shareholders and I’ll look after ours. And ours have already paid for this news and what we are doing is giving it back to them in a form that they want and that they demand. If the ABC disappeared, Fairfax and News Corporation would have as much trouble getting people to pay for their websites. Their problem isn’t us, it’s the hundreds of millions of websites out there, news aggregators, Google News. The ABC is a red herring in this argument, but we’re a convenient red herring for some who want to make the ABC smaller or less relevant. [RK] You’ve now worked as the MD through three governments and four prime ministers. Do you think there is anything different about the quality of the oppositional stance to the ABC taken by the current government compared to previous governments? [MS] If you look at the research that shows the overwhelming popularity of the ABC, I sometimes think we’re least popular within the grounds of Parliament House in Canberra and that’s because we’re doing our job. By and large politicians understand that the ABC has this great connection with the Australian public and I think they underestimate this at their peril. [RK] There used to be criticism that the ABC favoured one side of Australian politics, but now there’s an escalation – that the ABC is traitorous; against the very heart of what it is to be Australian. How do you see these comments? [MS] I saw a Nielsen survey the other day saying that only 1 per cent of Australians think we’re un-Australian. We’re overwhelmingly Australian – our content, the work that we do in the bush – the A is for Australian, and Australians understand that. [RK] Have you met Mr Abbott recently? [MS] I haven’t met with him since the election but I saw him during the campaign and would meet with him quite regularly when in opposition. He’s a former journalist and he understands journalism and journalists quite well. We have a very cordial relationship, I think. I think we can all be grateful that it’s the board that finally exercises the editorial judgement and works out where the money needs to be spent and how we fulfil our charter, rather than politicians. Malcolm Turnbull reinforced that in recent weeks. [RK] It was an interesting comment from Mr Turnbull. How much have you been the meat in the sandwich between Mr Abbott and his communications minister? [MS] No, no, no. Look. No, no. I’m not sure I agree with that. I think the PM and the cabinet absolutely understand that the board employs me (as you know) and finally I’ve got to be accountable to the board for delivery. Malcolm Turnbull was simply reminding the broader public that that’s the convention and that independence of the ABC is vital and needs to be treasured. [RK] What about your strategy in the face of these accusations coming at this exquisitely delicate time – a May budget in which I expect you might be concerned that the understandings between you and the former government might change? [MS] I feel it would be a terrible day if the ABC started commissioning its programs and exercising its news judgements because it was frightened of the reaction of those who allocate the money. You may as well give the game away if your agenda is being set with an eye to funding security. The PM was really quite clear before the election and reaffirmed that in the Parliament – no funding cuts to the ABC. In fact, he said the ABC will flourish under a coalition government. [RK] Do you think PM Abbott is at all impressed with the surveys that show that the ABC is the most trusted media organisation and, after the High Court, the most trusted institution in the country? [MS] They’re points I will make in my conversations with him. [RK] This rhetoric of his: home teams, friends and enemies, goodies and baddies, it’s a very black and white world view? [MS] Well, Ramona, you might say that. I’m not going to comment on your depiction of it. Let me simply say there is no one better at telling the Australian story, in the big cities and the country towns than the ABC, even though some of our programming may present some points of irritation. [RK] In 1987, communications minister Gareth Evans proposed that the ABC be split into “core and non-core” functions which would be open to sponsorship and other direct funding arrangements. The proposal provoked then ABC managing director David Hill and his board to mount a public campaign: “Only eight cents a day.” This reportedly changed the Hawke government’s mind. You’ve been talking a lot about audiences. Can you see the right moment for revisiting this kind of board-sanctioned campaign again? [MS] Most people would say that David Hill and I have very different personalities and styles. David was a very front-foot campaigner and advocate. 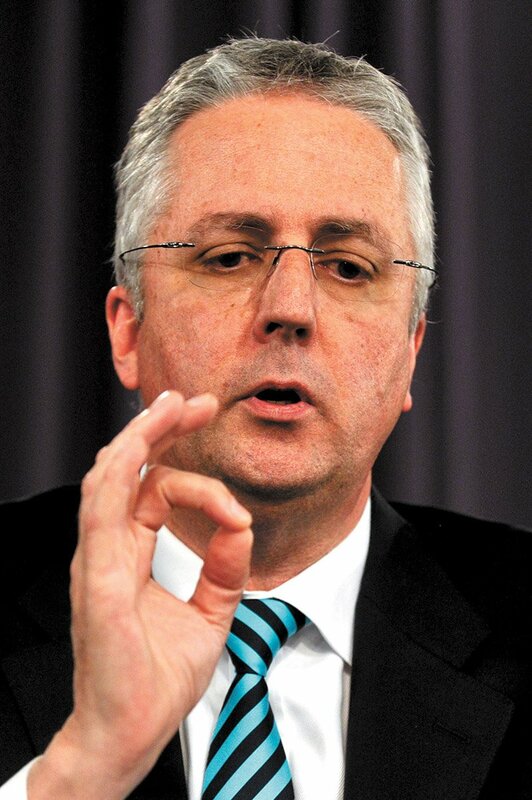 I hope I’m a strong advocate for the ABC but I’m not sure my style is to semaphore in the way that David did. [RK] Why wouldn’t you work with audiences for your own survival? [MS] I’m not sure that going to war or going head-on is the way to do that. I don’t think we should jump at shadows. We’re going to continue to reinvent this broadcaster to be a public broadcaster in the digital era and that’s the best way of safeguarding the future of this organisation. I’m focused on a long game here. Who will tell Australian stories in the era of global content media? Who will tell our stories dramatically? Who will have staff in regional areas? Who will invest in long-form investigative journalism? ← March Monthly Book – A Girl is a Half-Formed Thing.